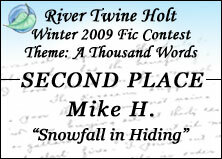 (2009 A Thousand Words Fic Contest) Snowfall decides to play a game of hide and seek with True Edge. The hunt had been long and arduous, but ultimately successful. 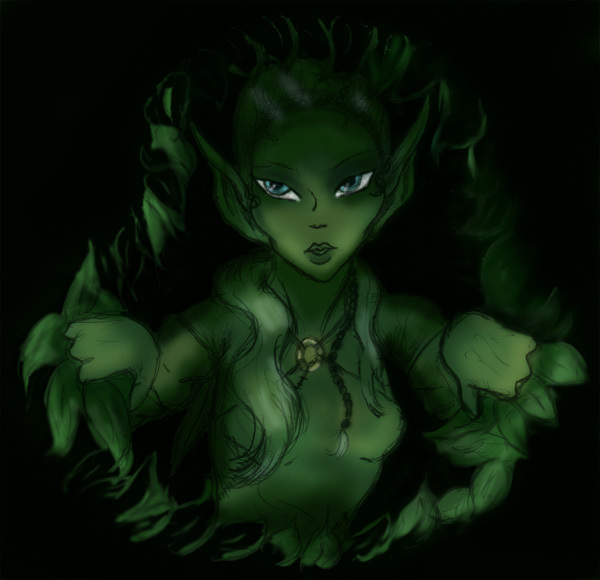 True Edge had bid Windburn and the rest of the elves he had ridden with farewell and made his way back towards his den. Fatigue was heavy in his limbs as he walked home with Charm and Duskgreeter loping along behind him. Windburn had kept them out two hands worth of nights, so was not surprised to see his old friend go to seek his mate. With a knowing smile, Windburn led the rest of the hunt to meet the rest of the tribe. True Edge�s thoughts were only on getting some rest and seeing Snowfall again. Being gone for so long, he had missed her terribly and wanted nothing more than to rest with her close by his side. A few moments later he found himself in the den he shared with her, but was disappointed to find that she wasn�t there. Testing the air he could tell that her scent was cold. Perhaps she was away teaching the cubs or knapping arrowheads for the next hunt. Still, she should have heard Windburn�s open send to the Holt or heard the howls of greeting from the other elves. As he puzzled over this he felt a familiar presence in his mind. A smile came to his face at her mental touch. The question was mundane but her tone was like a silky purr in his mind. It was the same tone she had when she was plotting some mischief, and that almost always turned out well for him. Ah, so that was her game. He could feel the gentle tease in her tone and the desire as well. She was going to make him work for it. He realized that she knew him all too well. His want for her aside, he could not turn down a challenge. Putting fatigue from his mind he turned from the den and leapt to the ground below. Once there he stopped to sniff the air for her scent again. Still nothing. This might be harder than he had imagined. Ignoring the curious stares of the two wolves that had accompanied him, True Edge stood and considered what to do next. Then it struck him: she had sent to him just a moment after he had entered the den. She had known when he had returned. That must mean that she was close enough to see when he had walked in. On a sudden impulse he turned and ran into the woods. Two could play at this game. From her vantage point, Snowfall watched with amusement as her lifemate had jumped to the forest floor and searched for her scent. She had known full well that that would be the first thing he would do. However, when he had run into the woods moments later, she became confused. He was heading away from her. What was he doing? She wasn�t sure but she knew how clever True Edge could be. This was probably part of some plan that she couldn�t discern. Best to move now just in case. Snowfall had planned this well. They had heard the approaching howls of the hunt in the Holt and she had plenty of time to hide in a tree near the river. From there she could see when he had entered the den. Now it was time to fall back a bit in case he had figured that part out. With cat-like grace she jumped to the forest floor and ran to another hiding place from which she could watch for his approach. Nearby she could see Slychase watching her curiously. Slychase seemed to shrug and turned to wander off in another direction. Snowfall grumbled under her breath. She really did want True Edge to find her. It would just be better if it took a bit of time to do it. His fatigue had been easy for her to feel in their brief mental contact but she was certain she would make the effort worth his while. Not too far away True Edge had indeed figured out where she must have been hiding. He had also reasoned that she would want to drag this game of hers out a bit, so would have more than one hiding place. His plan had been to circle around and come to her from a direction she wouldn�t expect. Soon he was approaching the clearing where he thought she must have been. Sometime along the way, Charm and Duskgreeter had decided to follow, though he wasn�t yet paying much attention to them just yet. Suddenly a plan struck him. He stopped and motioned for the two wolves to approach. Opening his mind to them he sent them images that they could understand; the vision of Snowfall and her scent that they would recognize. Charm was very willing to oblige. Duskgreeter was a little less enthusiastic but after some cajoling went along with the plan. Even to him a little play sounded good. With a grin True Edge prepared to sneak into the clearing with the distraction created by his two friends. A few moments later, much to Snowfall�s surprise, she saw the two wolves lope out into the clearing not more than a spear's throw from her. What were they doing, and why wasn�t True Edge with them? As she watched, they stopped and began testing the air for her scent. Naturally she quickly realized what they were up to. Before she could decide what to do next, though, another crash from the underbrush drew both her and the wolves' attention. Slychase had heard the approach of the others and had come to investigate. For several long seconds the three wolves stared at one another. Slychase had apparently decided to be included in the fun. As Snowfall watched, her wolf ran at the other two, crouched in the manner of a pup seeking to play, and then bounded off into the deeper woods. This was all the encouragement Charm needed and she set off in pursuit. Duskgreeter watched for a few moments and then finally joined in as well. It would seem that they considered chasing Snowfall�s mount to be pretty much the same thing as chasing Snowfall herself. In an instant all three of them were gone, running at full tilt away from her and out of sight. Words failed her as she watched them play the wolfish equivalent of tag. She even forgot for the moment that her lifemate must be close at hand if the two wolves were here. Suddenly remembering though, she decided she�d best look to see if he was close and then try to find another hiding place. She reached out to part the branches in front of her for a better view. It wasn�t hard to see where True Edge was at this point. She could now see that he was only about four wolf-lengths away and had turned at the ever-so slight noise she had just made. Seeing his face in profile she noted the smile that came to his lips as he turned to face her. �You had help,� she said defensively but with a smile of her own. She looked into his eyes and saw through to his innermost self. Though True Edge was normally guarded and somewhat gruff with others he was always open with her; just as she was with him. This fact always moved her and was a reaffirmation of the love they had for each other. He didn�t speak or send; merely held out his hand and smiled. She crossed the short distance between them and into his arms. There was no more time for words. She merely went to claim what was hers. Later, as the sun began to rise, she lay happily beside him. True Edge was in a deep slumber. He had used the last of his strength in finding and then loving her. Snowfall considered briefly whether to wake him but decided against it. The wolves had again joined them and rested nearby. Charm and Slychase might be about as clueless as a wolf could be, but Duskgreeter was a fierce old cur and wouldn�t let any harm befall them. In the end she decided to curl up beside him and sleep as well. They would be safe enough this close to the Holt with the wolves watching over them. Things were as they were meant to be. Her beloved was home and all was peaceful in the Holt. She would enjoy this sensation as long as she could.